The Justice companies still have the highest delinquent mine safety debt in the U.S. mining industry. Unpaid mine safety violations have been a chronic problem for the Justice companies. In 2014, an NPR investigation showed Justice companies owed just under $2 million in delinquent federal mine safety penalties, which are levied by the Mine Safety and Health Administration, or MSHA. 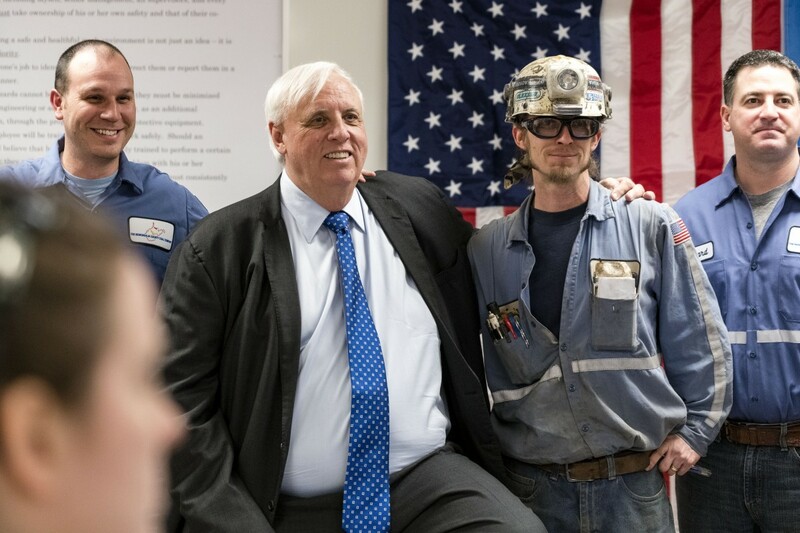 Two years later, when Jim Justice was running for governor, a follow-up investigation showed that the companies’ debt had climbed to $2.6 million, making the Justice companies the nation’s top delinquents in unpaid mine safety fines. Then-candidate Justice said those debts would be paid. But the ReSource analysis of 2018 MSHA data shows that more than four years after that initial investigation, the Justice companies — now mainly controlled by the governor’s children, James Justice III and Jillean Justice — have not significantly paid down their debt. Instead, as of the end of 2018, the Justice companies’ debt had ballooned to $4.3 million. That’s according to MSHA data which was obtained by NPR and correspondent Howard Berkes using a Freedom of Information Act lawsuit. The data set, known as “Debt By Age,” provides a snapshot of delinquent mine safety fines, and the history of each penalty, as of December 5, 2018, and includes interest, late fees, and the original fine amount. The ReSource analyzed that data and other information available on MSHA’s website and found the Justice family companies had a mix of new delinquent penalties and mounting interest on old debts. The delinquent penalties were accrued between June 2009 and August 2018 at 71 mines in Alabama, Kentucky, Tennessee, West Virginia, and Virginia. Collectively, the Justice companies’ unpaid fines and penalties account for nearly 10 percent of all delinquent debt owed by mining companies in the U.S.
Former federal mine safety officials and industry experts say the continued disregard for paying mine safety fines shows a lack of respect for the regulatory system created under the Federal Mine Safety and Health Act to keep miners safe. “A very significant portion of this total is made up of penalties assessed to Mechel OAO, a Russian mining company, while it owned Bluestone Coal and related companies in WV prior to acquisition by the Justice Family,” he stated. In May 2009, Mechel OAO purchased Bluestone Coal Company from Justice. In 2015, Justice bought the company back. The metallurgical mining company has operations in West Virginia’s McDowell and Wyoming counties. Proxies for the Justice companies have in the past claimed that delinquent mine safety fines now being attributed to Justice were actually incurred by Mechel OAO. However, the ReSource analysis of the MSHA debt data used a system that includes only debt for violations assessed to owners at the time of the initial violation. In other words, the debts associated with violations assessed to those mines while they were owned by Mechel are not included in the $4.3 million total that MSHA data show the Justice companies are responsible for. This would dispute Getty’s argument, something MSHA echoes in a terse written statement to the ReSource. “MSHA stands by its assessment of fines and penalties for the Justice companies,” an agency spokesperson said in an email. The ReSource filed a Freedom of Information Act request for all settlement agreements and payment plans made between the Justice companies and MSHA dating back to 2014. The agency replied with a document on one such agreement, finalized in late 2015, that covered about $1.5 million in assessed penalties to be paid down over 21 months. It’s unclear if the Justice companies completed the payment plan. The final payment was due in September 2017. However, the ReSource’s analysis of MSHA data shows delinquent debt owed by the Justices increased by $1.35 million between March 2016 and December 2018. While the Justice-owned companies are the top delinquents, they are not the only mining companies in the region that fail to pay their fines and penalties. The ReSource analysis found thousands of mine operators around the country continue to not pay fines and penalties assessed for health and safety violations at the nation’s mines. MSHA is owed more than $45 million in overdue fines, some as old as 1994, the data showed. Delinquent mines represent about 8 percent of the nation’s more than 40,000 coal, metal and non-metal mines. But that percentage rises when just looking at coal mines. Eleven percent of the nation’s coal mines have past-due, unpaid fines and penalties. Of the country’s active, producing coal mines, 23 percent are delinquent. The analysis shows there are potentially major impacts to the health and safety of miners working in the small subset of mines that fail to pay penalties. According to the ReSource analysis of MSHA accident and injury data, injury rates for miners working in delinquent underground coal mines are 31 percent higher than rates at mines that are not currently delinquent. The enforcement regime used by MSHA — mine inspections, citations and penalties — exists to protect the nation’s coal miners, said Patrick McGinley, a professor of environmental law at West Virginia University. In the statement to the ReSource, Justice attorney Getty touted the company’s safety record, despite owing millions in unpaid mine safety fines and violations. “The Justice Group is also very proud to report that its accident and incident history of currently operated mines is very favorable,” he stated. The ReSource analysis found that injury rates at delinquent Justice mines fall close to the national industry average. However, that does not mean those mines were free of unsafe conditions. While delinquent, from 2009 to 2019, Justice mines had 5,560 violations for things like failing to maintain equipment, accumulation of combustible materials, and failure to develop and follow ventilation plans. Nine violations were for conditions that federal regulators say placed miners in “imminent danger” of death or serious physical harm. About one-third of violations issued at delinquent Justice mines were listed as what MSHA calls “Substantial and Significant,” meaning that the observed conditions at the mine present a reasonable likelihood that an injury or illness will occur. In addition to the Justice family companies, three other mine controllers in the Ohio Valley owe more than half a million dollars in unpaid mine safety fines and penalties, according to the ReSource analysis. The data show Revelation Energy LLC founder, president and CEO Jeff Hoops is the controller responsible for more than $926,000 in delinquent mine safety mines from citations at 50 mines. The Virginia Conservation Legacy Fund, a nonprofit founded by Virginia businessman Tom Clarke, owes about $736,000, according to MSHA data. The fines were accrued at two mines. Martin County, Kentucky, native James Booth, longtime coal magnate and president of Booth Energy, also makes the list. Booth is listed as controller for about $582,000 of debt in the MSHA data, stemming from violations at 18 mines. Multiple phone calls requesting comment from Hoops and Booth were not returned. A representative for Clarke did not respond to a request for comment. Joe Main, former head of MSHA during the Obama administration, said mine operators that run delinquent mines are operating at an advantage. Matt Hepler, environmental scientist for the environmental group Appalachian Voices, said the Justices stick out in the region not only for failure to pay federal mine safety fines, but also for debts to their suppliers, overdue taxes, and delayed work to adequately reclaim land at surface coal mines. During the Obama administration, MSHA began taking steps to reduce the amount of delinquent debt. Main ramped up those efforts, forming the agency’s “scofflaw” program. Efforts under the program included notifying delinquent operators they would face closure if fines continued to go unpaid. For companies that had long stopped mining, the agency began sending 1099 tax forms, which meant mining companies would owe taxes on unpaid debt. The agency also worked with the U.S. Attorney and other federal agencies to go after debtors. “We had a toolbox of different approaches to take,” Main said. Under the Trump administration, the agency says it has continued efforts to reign in scofflaws. The release said 49 mine operators had either taken steps to enter into payment agreements or had satisfied their delinquent debts, but the agency has not identified those companies. McGinley said it’s hard to know to what extent MSHA under the Trump administration is working to collect delinquent debts. “They’re not being transparent with regard to any efforts that they’re they’re making,” he said.